Irish immigrants in America. Ellis Island. Immigration to New York and other ports. Irish immigration to America after 1846 was predominantly Catholic. The vast majority of those that had arrived previously had been Protestants or Presbyterians and had quickly assimilated, not least because English was their first language, and most (but certainly not all) had skills and perhaps some small savings on which to start to build a new life. Very soon they had become independent and prosperous. More about pre-1846 immigration here. 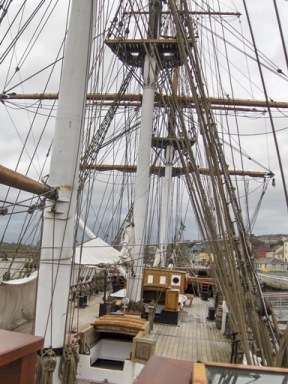 The Dunbrody is a replica of an emigrant ship that sailed in the 1850s between New York and New Ross, Co Wexford, (where the replica is moored). The arrival of destitute and desperate Catholics, many of whom spoke only Irish or a smattering of English, played out very differently. Suspicious of the majority Anglo-American-Protestants (a historically-based trait that was reciprocated), and limited by a language barrier, illiteracy and lack of skills, this wave of Irish immigrants sought refuge among their own kind. 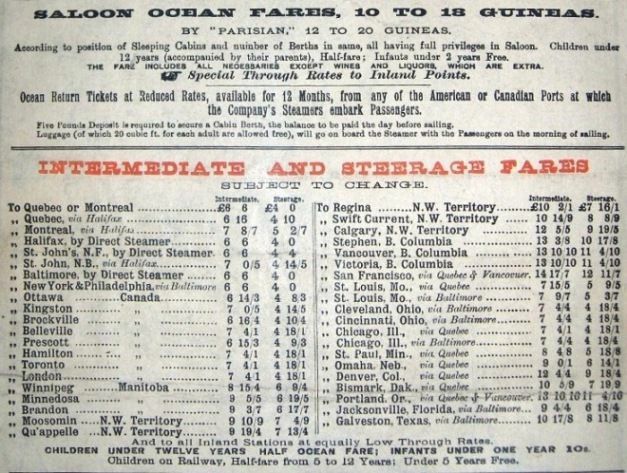 Ireland was also part of Britain, and fares to Canada were cheaper than fares to the USA, especially after 1847. Those that survived the journey often had just one thought on their minds: to be free of British oppression. While many chose to settle in Canada, substantially more managed to find the physical and financial resources to reach America. Of course, there were some who were blacksmiths, stonemasons, bootmakers and the like, but the majority had had no formal training in anything. 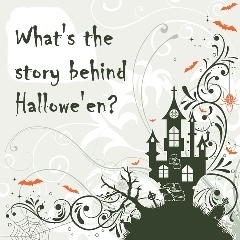 On passenger manifests the men claimed to be labourers; women said they were domestic servants. In most cases, they had little or no previous experience in these roles; these positions were the limit of their aspirations. From 1831 to 1920, this national newspaper published 'Missing Friends' advertisements which usually referred to the exact townland of origin of either the person being sought or the person who placed the ad. They route of the individual's journey to America, and even the name of the ship, were often stated. Many of the ads refer to women, for whom determining the exact place of origin can often be more difficult because they didn't apply for naturalisation (this status was passed to them by their husband). 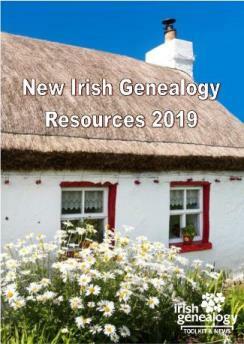 Some databases charge for this resource but you'll find an incomplete version is available free through the Boston College Irish Studies Program. After 1855, the tide of Irish immigration to America levelled off. However, the continuing steady numbers encouraged ship builders to construct bigger vessels. Most of them still made the voyage east with commodities to feed England's industrial revolution, but shipowners began to realise the economic advantages of specialising in steerage passengers. Conditions onboard began to improve -not to a standard that could even remotely be called comfortable today, but improved, all the same. By 1855 iron steamships of over 1500 tons were becoming increasingly common, and competition was growing. So much so that steerage fares on steamships were often lower than on sailing ships, and voyage time was considerably quicker at less than two weeks. This reduction of voyage time was a two-fold blessing. Not only did this mean the emigrant had to suffer the discomfort of steerage for a shorter period, it also made the concept of Irish immigration to America - the leaving of family and homeland - seem less permanent. By 1855 iron steamships of over 1500 tons were becoming increasingly common, and competition was growing. So much so that steerage fares on steamships were often lower than on sailing ships, and voyage time was considerably quicker at less than two weeks. The reduction of voyage time was a two-fold blessing. Not only did this mean the emigrant had to suffer the discomfort of steerage for a shorter period, it also made the concept of Irish immigration to America - the leaving of family and homeland - seem less permanent. Based at Castle Garden, near the Battery at the southern end of Manhatten, it had earlier been a fort, a cultural centre and a theatre. Now it was pressed into service as a place to receive immigrants. 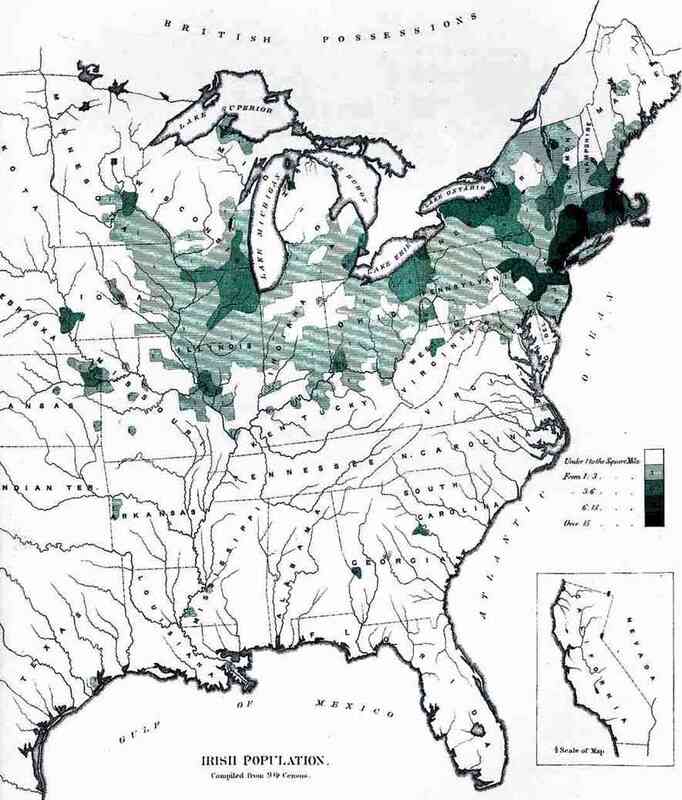 The map below shows the Irish population of the United States based on statistics from the 1890 census. 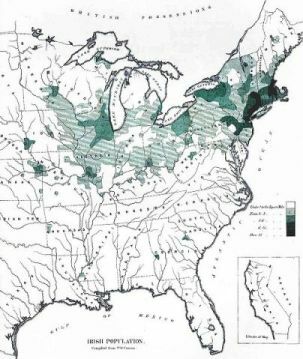 The map to the right shows the Irish population of the United States based on statistics from the 1890 census. After Castle Garden closed in 1890, Irish immigrants to America (and all other immigrants) were processed through a temporary Barge Office. Then, on 1st January 1892, the Ellis Island reception centre opened. Annie Moore, a 15-year-old from Co Cork, was the first passenger processed, and more than 12 million followed her over the next 62 years. By this time, attitudes towards the Irish had begun to change. The Civil War was probably the turning point; so many thousands of Irish whole-heartedly participated in the war (they made up the majority of no less than 40 Union regiments), and gained a certain respect and acceptance from Americans as a result. 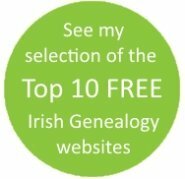 And second or third generation Irish-Americans had moved up the social and managerial ladder from their early labouring work. Some were even entering the professions. By this time, attitudes towards the Irish had begun to change. The Civil War was probably the turning point; so many thousands of Irish whole-heartedly participated in the war (they made up the majority of no less than 40 Union regiments), and gained a certain respect and acceptance from Americans as a result. And second or third generation Irish-Americans had moved up the social and managerial ladder from their early labouring work. Some were even entering the professions. Of course, this was not the lot of the majority. In the 1900 census there were still hundreds of thousands of Irish immigrants living in poverty, mostly in urban slums. But economic circumstances were improving for a significant proportion, and the Irish, as a group, were gaining footholds in the workplace, especially in the labour or trade union movement, the police and the fire service. 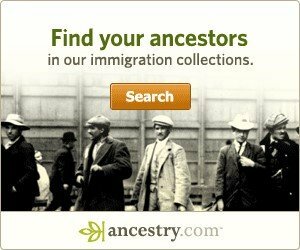 At the turn of the century, Irish born immigrants made up 2.12% of the US population. More importantly, Irish Americans – those Americans born to Irish parents – made up 6.53%. A sizeable group, indeed.